With E-TTL flash metering the camera will send out a pre-flash that's used to determine the exposure for the scene, and then it sets the power of the flash heads for the main flash burst. With ratio control your telling the flash to take the total amount of light that the camera want's to use for the scene and send more of it out a single flash head. But the total amount of light that the flash produces is the same with or without ratio control, in other words ratio control is not the same as flash exposure compensation (FEC). So with ratio control enabled you run the risk of over exposing part of the scene, and it's been my experience that the E-TTL pre-flash is not affected by ratio control (or if it is it doesn't have any effect on how the camera is metering the scene). I usually have one flash head at the top of the lens (the key) at the 11 O'clock position and the other flash head is off to the side (the fill) at about the 2 O'clock position (relative to me) on the flash mount that Canon supplies with the MT-24EX. I also use a Kaiser Adjustable Flash Shoe to get the key flash higher, and at a different angle, than the key to cut down on glare. If both flash heads are mounted directly to the Canon flash mount then the angle between the flash heads, subject, and sensor will be the same -any shiny surface is going to cause problems since both flash heads will be hitting the same spot at the same angle. The Kaiser Adjustable Flash Shoe is not "keyed" to clip into the Canon flash mount, but I cut two groves in mine with a Dremel tool so that it locks in place like the MT-24EX's flash heads. The angle of the individual flash heads can also make a big difference. I usually keep them both pointed directly at the subject and at the same angle. If Im getting some glare that I dont like and I have time to correct it then Ill angle the flash head thats causing the problem either toward the lens or toward the subject it depends on the scene. Also the magnification that I have the MPE-65 set to determines how I have the flash heads angled, and its kinda tough to show it in a photo so Im going to do my best to explain it. If you own the MT-24EX then you know that the flash heads make a clicking sound when you move them up and down. So as a starting point push the flash heads all the way down so that they are pointing toward the lens. For life size bring both flash heads up one click. For twice life size and higher magnification leave both flash heads all the way down. My method of angling the flash heads at the various magnifications keeps them pointed directly at the subject, and it keeps the flash duration short. In some situations you might what to change the angle to eliminate bad reflections, but the angle that I set the flash heads to works most of the time. You can also turn the flash heads from side to side, and you might want to depending on how close the subject is to the background. The way that E-TTL metering works is that there is a pre-flash before the main flash fires that the camera's light meter uses to set the exposure for the scene. If very little of that pre-flash makes it back to the camera (it can happen if the background is more than 6" or about 15cm from the subject) then the background will be very dark or black and the subject will be over exposed because the light meter gets fooled into trying to expose the background. But if you turn the flash heads toward the subject, especially the fill light (the one that I position on the side of the lens) then most of the pre-flash will hit the subject and the meter will give you a correct exposure. A guide on how I use the Canon MT-24EX macro twin flash. Updated text on 18 Feb 09. Thanks very much for the answer Dalantech!.I have two sto-fen difussers and two gary fong.My difusser is: I have put a piece brik of milk directly in the crystal of the flash and above i put of sto-fen with white insulating tape in the part that reflect the light.It seems that it gives a very diffuse light,better than with gary-fong.I see too your article with the nikon sw-11.For you,wich is the best way now,of spreading the light in the mt-24ex? ?.Thanks again and sorry for my english! I'm still using the Puffers -with the SW-11s I was losing three stops of light. With the Puffer diffuser that I use now I only lose one stop. Have learned much from your research, much thanks. Just received my MT-24 today along with the stofen, puffers, lumiquest reflectors and manfrotto diffusion sheets. Can't wait to start the diffusion project for the heads. What I am going to like with this flash combined with my 7D and 100 L IS is the ability to shoot without the hindrance of a tripod and being really mobile. I have had good success at 1.37:1 with AI Servo auto focus with this lens(new Hybrid IS). I have one 25mm extension tube (Canon) on the 100mm now and want more magnification. Will only consider putting on one other 25 mm tube (Canon only) - What would the approx magnification be? Around 2:1? Next purchase will definately be the MP-E 65 after I get in a lot of practice with this rig. 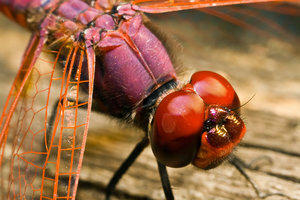 I'll stop rambling - Again, love your work and am now hooked on macro photography thanks to You and Brian Valentine. I don't know how much focal length the IS version of the 100mm loses at minimum focus, but the non IS version was about a 70mm lens and required that much extension to hit 2x. Thank you very much for your tutorials!One question, use one or two Kaiser Adjustable Flash Shoe,in what head?, is better than hama?.Thanks!! I have two just in case I want to elevate both heads, but most of the time I only use one. I have no questions...I just enjoy looking through your camera. i wonder if i have the MT-24EX,..cause i never get the detail on every shot,..
Heck man I am still stuck on trying to build the LordV diffuser for my 430 EX lol...however I have this marked for they day I can finally upgrade to the big boy! As for the Gary Fong Diffusers... have you permanently glued them on? or... are you using some sort of rubber cement. and... have you tried the Stofen diffusers? made for the MT24EX? I'm thinking about making my own diffusers out of Plexi... just as I have made my own Flash bracket. yeah... it didn't actually work as well as I had hoped... I found out.. that the only way it will diffuse better is to make the diffusion filter Larger than the flash's face and also bounce flash produce better diffusion. have you tested the Sto-Fens? comparing with and without?? 3 shots Without diffusion, 3 shots With Sto-fen, 3 shots With Sto-fen fluorescent filtration imbedded. and Sto-fen-Mod was slightly more diffuse. the Lucite does not seem cause the flash to need more power... (using in Manual mode, the same power fraction and aperture yielded little difference in the exposure. I realized that the Sto-fen Omnibounce don't diffuse at all... unless there is something near for light to be bounced from... I guess thats why its called Omnibounce. from this yes I did however realize a definition difference between a Diffusing the source and scattering from the source. Where as the Omnibounce scatters the light, in hopes that something else is near to reflect the scattered light and creating the effect of diffuse light. which also wastes light. and my "Great Idea" of putting those added filters inside.. only scattered the light more. so now I'm thinking of a few new designs.